Painted edge business card printing effortlessly delivers a bold look to go with your brand. These luxury business cards look different than any other card and feel strong. They are sure to make a strong impact whenever you hand them out. Painted edges are available in 14 different colors, including gold and a selection of other metallic colors, if you need an extra sparkle on your cards. These business cards are twice as thick as standard cards, since they are printed on 32 pt. uncoated cardstock, offering a superb heft and feel everyone will notice. These premium cards are popular with photographers, designers, and other creative professionals who understand the value of amazing, thick business cards. 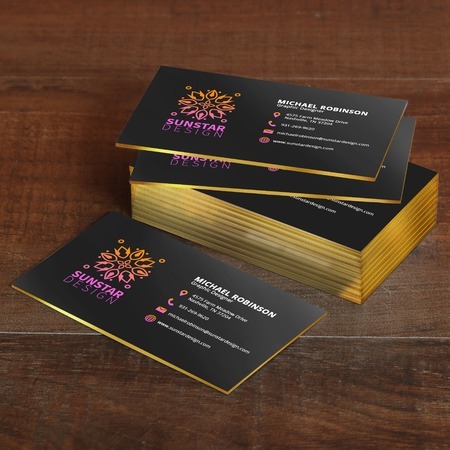 Colored edge business card printing also reinforces the luxury image of any upscale brand, making them popular with boutique lines and shops. Want to learn more about painted edge business card printing and other custom options? Contact us and we can customize something for you.